Last June due to a very wet Sunday afternoon we cancelled the parish walk. The theme for that walk was ‘Marking the year of Mercy’ by Remembering people and tragedies dating back past 100 years. 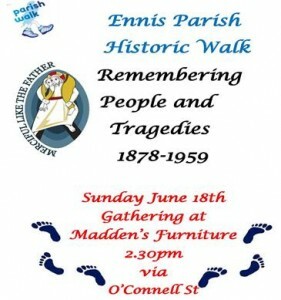 This walk will now take place next Sunday 18th of June 2:30pm commencing at the Old Jail Road, outside Madden’s Furniture shop. We look forward to all participating and to a fine day.